Well established Carvel® Ice Cream franchise for sale in a great location! This established Carvel® Shoppe is located on a commercial strip on main thoroughfare in high income residential area of Great Neck. Street parking is available. Located 5 minute walk from Great Neck North High School. Next to Subway Sub shoppe. Carvel in this location since March 1972. Potential to re-locate. 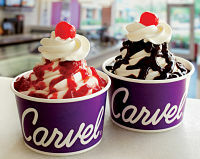 The Carvel® brand was created with the understanding that people always crave a happy escape. Since Tom Carvel first dreamt of selling the ice cream, our Guests have turned to Carvel for their little occasions and big celebrations. We are a break from their routines and a chance to reconnect. These moments of joy are why the Carvel® name is so loved. Guests have traveled hundreds of miles for our handmade Carvel® cakes. We’ve received messages from fans begging us to bring their favorite ice cream brand to their areas. Which is why we continue to build upon our history and signature products. We have expanded our menu and our footprint, with more than 400 locations in 25 states and five international markets.